The purpose of the Ukrainian Museum of Canada is to acquire, preserve, study and interpret, on a national basis, representative artifacts which depict the Ukrainian heritage and its contribution to Canada. We are actively involved in promoting ethnographic arts and history locally, provincially and nationally! 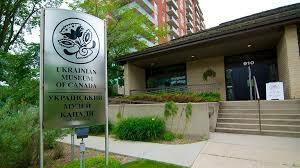 The Ukrainian Museum of Canada overlooks the South Saskatchewan river and is within Saskatoon’s vibrant downtown. In the summer, the riverbank is the center of many different heritage, arts and cultural events.